If your native habitat is 1000m-3000m above sea level, you have to be tough and so it is with rhododendrons. The hardy types really come into their own in early spring but there are varieties that flower much earlier and some bloom as late as December. ‘Marquis of Lothian’ dates from about 1880 and is still a worthwhile choice. 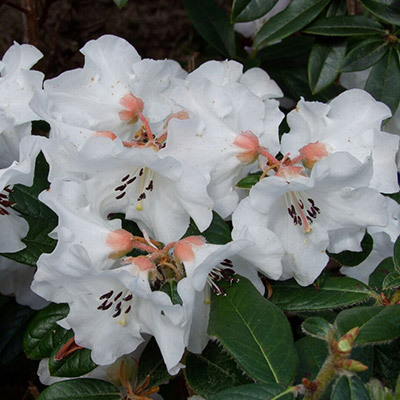 Doug Thomson, curator of the Rhododendron Dell in the Dunedin Botanic Garden, recalls an old hybrid, ‘Polar Bear’, that was popular with southern gardeners as it flowered in March. ‘Polar Bear’ was English in origin but New Zealand breeders have added a significant number of fine varieties to the international lineup. The first rhododendrons came into New Zealand about 1860 and within 20 years, Kiwi hybrids were appearing, Doug told me. Generally acknowledged as being the first was ‘Marquis of Lothian’, bred by Dunedin nurseryman William Martin about 1880. However, it was many years before it was formally registered and only then thanks to the efforts of the New Zealand Rhododendron Association, whose formation in 1944, had “stimulated interest and enthusiasm”, Doug said. In the early days, there were three main centres of rhododendron growing and breeding. Dunedin’s role was underpinned by the work of botanic garden superintendent David Tannock, who in 1914 started the Rhododendron Dell collection with 500 plants he imported from Britain. In Taranaki, along with Bernie Hollard and William Douglas Cook, John Yeates was instrumental in establishing Pukeiti, famous for its 2000-strong collection, while a major influence on rhododendron breeding in the province was Felix Jury, who produced numerous cultivars, including ‘Barbara Jury’. In Canterbury, Edgar Stead’s Ilam strain – named for the Christchurch suburb where he lived – proved a winner with the public and the likes of ‘Ilam Cream’ are still popular. 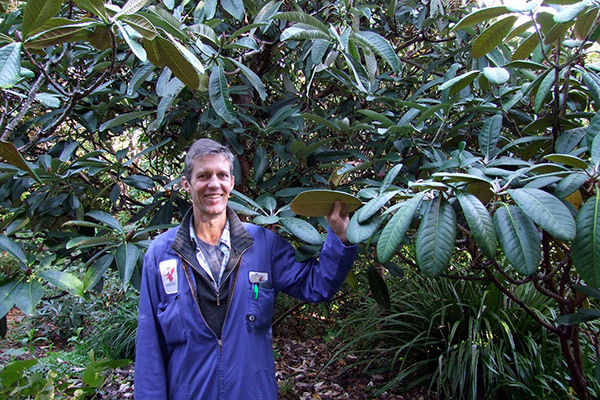 Recognising the importance of home-grown rhododendrons, Doug Thomson has added more to the dell during his 27 years at the Dunedin Botanic Garden. Of more than 300 New Zealand hybrids, the dell has over 50, some pruned to enable visitors to appreciate the beauty of their trunks. Pink: ‘Marquis of Lothian’ – “Probably my favourite of the New Zealand hybrids”, he says. White: ‘Alpine Meadow’, which grows to only 30cm, or ‘September Snow’, which is about twice the height and has excellent perfume. Both are suitable for low hedges. Red: ‘Rubicon’ or ‘Robert Balch’ – “They’re both great reds,” Doug says. Lavender: ‘Blue Mist’, bred by Robert Balch in 1960, was a cross between blue R. augustinii and scented white R. maddenii. Yellow: ‘Lemon Lodge’, bred at Pukeiti in Taranaki. Other popular New Zealand varieties are Jeff Elliot’s ‘Kiwi Magic’, whose frilled flowers open pink and mature to cream around the lobes Edward Stead’s scented ‘Ilam Cream’ Bernie Hollard’s bright red ‘Kaponga’ Felix Jury’s ‘Barbara Jury’, ‘Bernice’, Felicity Fair’ and ‘Floral Legacy’, and Mark Jury’s deep yellow ‘Saffron Queen’. But ‘Southland’ is not ours: it was bred in the United States. We talk about azaleas as if they are separate but they are in fact one of three main groups of rhododendrons. The largest group, which we commonly call rhododendrons, includes most of the bigger forms. The third group, the vireyas, are the tropical rhododendrons from Southeast Asia. 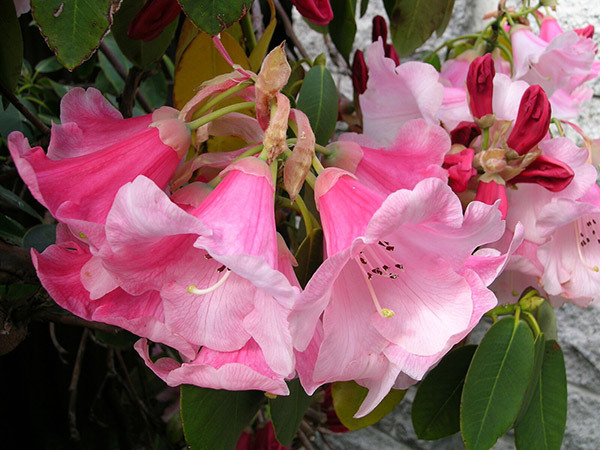 Rhododendrons are known for their hatred of lime and need acid soil – a pH of 4.5 to 5.5 suits them best. Under the shadow of evergreens they do not flower well but are happy in the dappled shade of deciduous trees, although “yaks” (R. yakushimanum and its hybrids) tolerate a more open situation. Peaty soil to which some extra nourishment is added is ideal but Doug Thomson warns not to overdo the fertiliser. “Don’t kill with kindness,”he says. Specialist rhododendron fertiliser can be used but he prefers a 2:1 mix of blood and bone and superphosphate. Apply a handful per plant between early September and late January “to give it a boost and encourage flowers”. Because the feeding roots are close to the surface, “don’t get over-keen with the hoe, especially with young plants it’s like chopping up their mouths,” Doug says. Rhododendrons that have suffered damage may get root rot and leaves can be affected by rust (cut out affected branches or control by spraying with Captan or Bravo). The more common problem, though, is powdery mildew, most likely to strike in spring and autumn when daytime temperatures are between 22°C and 27°C and the associated cooler evenings encourage the fungus. Control with a sulphur, milk or baking powder spray. Commercial rose sprays can be used, too. Doug Thomson shows the fuzzy underside (indumentum) of R. hodgsonii in the Rhododendron Dell at the Dunedin Botanic Garden. Breed your own When William Martin crossed red R. thomsonii and white R. griffianii to create ‘Marquis of Lothian’, whose flowers start deep coral-pink and fade to almost white as they age, his success showed how the recessive genes of different-coloured parents can produce a flower of a completely different colour. Although Martin undoubtedly made informed choices about which rhododendrons to cross, anyone can try breeding, simply by saving seed and sowing it. As it can take seven years or more for a seedling to flower, growing new varieties requires patience.